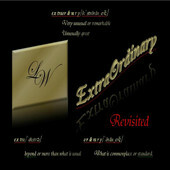 Before listening to LW‘s album, “Extraordinary Revisited”, I listened to a track from the album,”Extraordinary“, after it was selected as a The Mellow Mix Pick of the Week. “Extraordinary” was pretty good; it brought back sounds to my ears that I haven’t heard since my years in high school. Pop R&B nowadays usually blend the vocal side of an artist with crazy production. There’s a limited number of artists that have a soulful sound, and give you something that would help you wind down, instead of getting you ready for a party all the time. Extraordinary Revisited brings back that soulful sound, with a vibe that reminds you of throwback 2000’s R&B. LW’s sound is very cool, and provides an array of smooth tunes for the ladies and the couples. This sound is a simple addition of instruments and beats, but when it’s all put together, the songs get interesting. One of the songs that illustrates this is “If I Knew.” The beat gets you grooving, while LW’s vocal’s take over. One of the more active songs on LW’s album is “Blueprint“, a track that has LW singing out a blueprint on making a family with his woman, but a lot of the songs are for those nights with your other. “One Mo Gan” is one of those songs. That bass in the back is simple, yet with the keyboards, it produces a slowed down vibe. Extraordinary Revisited also includes a good number of remixes as well. One of the best remixes on the album has to be “Pac Man“, just because the beat includes actual samples from the classic game of the same name. Some of the remixes got a little thump in the production, including the remix for “I Be Me (Remix)“. The remixes are a decent alternative to the original tracks on the album. Extraordinary Revisited‘s production doesn’t use that many samples, but with what it has, it provides a dope atmosphere for LW to chime in vocally. LW’s vocal game is solid; he doesn’t try to go for overly long tunes, yet his voice holds up and is still powerful nonetheless. In conclusion, LW has done a ﬁne job with Extraordinary Revisited. It’s an album for the ladies, or when a dude is with a lady. The album does a good job of providing traditional R&B. With music that’s always mixed in to electronic production and a more aggressive sound, it’s always better to find something that’s closer to soul the most popular R&B artists. I’m waiting to see where LW can go with his sound. Extraordinary Revisited is a great base that can be evolved into something that can bring true R&B back to what it used to be. What will we see next? Tags: "The Mellow Mix", @DJHarveyDent, @shani_elliott, @TheMellowMix, @therealcyndiva, @traichic, @VBrinkley513, Extraordinary Revisited, LW, Vance Brinkley. Bookmark the permalink.